Posted on January 18, 2009 by D.C. This came out of nowhere – a new ultraportable laptop from Sony has shown up at the FCC to undergo various tests before it’s allowed to be sold in the US (most having to do with wireless networking). The reason why I said it came out of nowhere – it appears, as several have pointed out, that this matches the Sony VAIO Type G that came out in the second quarter of 2007 in Japan. The model numbers typically started with “VGN-G1”. One of the biggest indicators – it has a 12.1″ non-widescreen display, just like the original 2007 G did (with a 1024×768 resolution). The original G was based on Intel’s 945GMS Express chip set (GMA 950 graphics) and features Ultra Low Voltage (ULV) CPUs, both Core Solo and Core Duo. The G-series was one of the first to ship with the option of a Solid State Drive (SSD) – originally a 32GB, which bumped the price way up. The one at the FCC has an optical drive (maybe optional), what looks like a PC Card slot, and typical other options. As the comments at Engadget point out, it doesn’t make a lot of sense unless the price is radically lower than the original asking price (which was in the $1800+ range). Why Sony waited so long to introduce this is a mystery. Posted on January 17, 2009 by D.C. When Asus began selling the Eee PC line of netbooks/sub-notebooks, whatever you prefer to call them, they (and later Acer and MSI) seemed to have problems defining who they were for, or at least the message wasn’t clear. It wasn’t helped by the fact that Best Buy and other physical retailers (along with the online retailers) weren’t sure where they fit into the laptop family. Many of us had no problem defining where they fit in – basic internet use and mainly as a second machine. That’s been changing over the past several months. I saw this in action twice today. 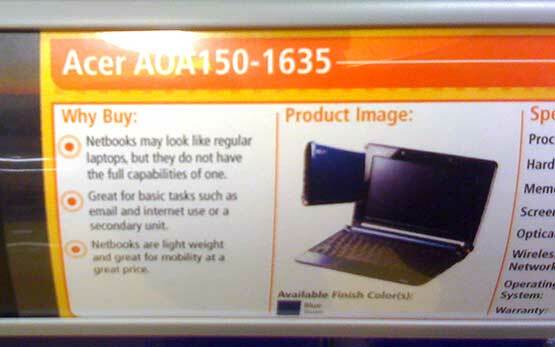 * Netbooks may look like regular laptops, but they do not have the full capabilities of one. * Great for basic tasks such as email and internet use or a secondary unit. * Netbooks are light weight and great for mobility at a great price. 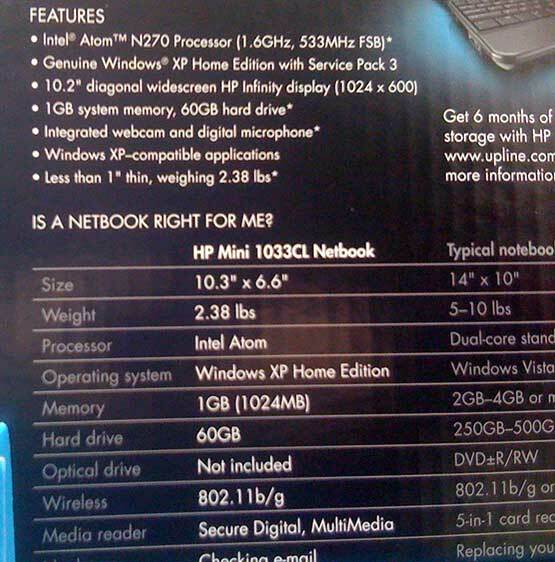 They then included a large comparison titled “IS A NETBOOK RIGHT FOR ME?” with a point-by-point comparison between the “HP Mini 1033CL Netbook” and a “Typical notebook” (typical = 14″ display, 5+ pounds, 2GB RAM, 250GB+ drive space, optical drive, etc.). Samsung NC20 – it’s got a VIA Nano in it! Posted on January 15, 2009 by D.C.
About three weeks ago, some specifications of the 12″ Intel Atom-powered Samsung NC20 leaked out through online retailers. Yesterday, news came of the user manual for the NC20 being online, and it’s confirmed some things that surprised me. I mentioned that I thought the VIA Nano CPU listing was inaccurate (the information was from some online retailers, but Intel Atom was also listed). This is a huge deal – the NC netbook series was already fairly high-profile (for its design, features, and battery life), and VIA convincing Samsung to add the Nano to the NC lineup is a huge win for VIA, especially after HP switched to the Intel Atom for their new netbook updates and models. While it’s supposed to be a little harder on the battery, it’s been reported that the Nanos have better performance than the Intel Atoms. This is a huge win for VIA and it will be interesting to see what the production models are capable of when it comes to performance. Posted in Announcements, Netbook, News, Samsung, Solid State Drives, VIA | Comments Off on Samsung NC20 – it’s got a VIA Nano in it! Posted on January 13, 2009 by D.C. It looks like the 13.4″ MSI X-Slim X320 won’t be going up against the 13.3″ Apple MacBook Air after all. The MacBook Air has a full (albeit lower voltage) Intel Core 2 Duo powering it, versus the single-core Intel Atom powering the X320, leaving the X320 trailing the MacBook Air when it comes to performance. MSI plans on an X-Slim laptop that will be using regular, higher-powered Intel CPUs, that will be able to compete with the MacBook Airs. Vincent Sung, assistant Vice President of MSI’s notebook research and development mentioned the ultraportable in comments to PC World. While the X320s are expected to sell for less than $1,000 USD, the high-powered X-Slim laptops will be sold for over $1,000 USD. They will also be loaded with Microsft Windows Vista Premium. How much larger such a device will be over the X320 remains to be seen. NVIDIA was showing off a demo model of the upcoming NVIDIA Ion platform, based around Intel’s Atom CPU. PC Perspective and HotHardware both have videos of the Ion platform, and you can get an idea of just how small it was, and how cool-running it is. Given that this was a non-portable demo, they had the 1.6GHz dual-core Atom 330 installed (although a dual-core Atom and the Ion should eventually make their way into netbooks later this year). The Ion platform contains NVIDIA’s GeForce 9400M GPU for graphics processing. Assuming the price is able to be kept low when netbooks based around this platform launch, we should be able to get 1080p and all of the bells and whistles that come with Windows 7, as well Vista if you decide to go that around (although by the time the Ion launches, Windows 7 should be available).